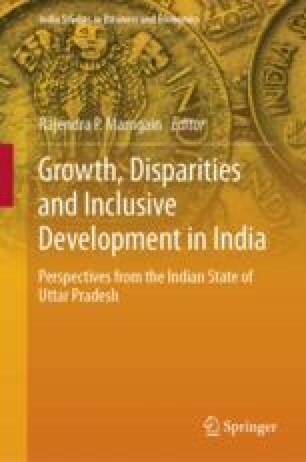 This article analyses the pattern and trends in inter-district disparities in the levels of development particularly in levels of income, and physical and social infrastructure by using multivariate analysis. It finds wide regional disparities across districts in the availability of social and economic infrastructure which have persisted and prolonged over time. Amongst the four broader economic regions, the districts of western region continued to occupy top ranks in economic infrastructure as compared to other three regions, viz. central, eastern and Bundelkhand. Bundelkhand region presents the grim scenario with almost six out of seven districts falling in the category of backward districts in India. The central and eastern regions have almost mediocre status. Such a pattern provides a strong justification for the recent policy initiatives of the state government for improving the economic infrastructure especially banking services, industrialization and agricultural infrastructure to facilitate production and sale of outputs and social infrastructure for building human capital. However, budgetary support for such initiatives and weak implementation are major concerns for any meaningful results, particularly in backward districts. The article advocates more rigorous efforts towards developing economic and social infrastructure, particularly in laggard districts of the state. This would also help in accelerating the pace of economic growth and employment opportunities, and reducing regional disparities in development in Uttar Pradesh. See Annexure Tables 9, 10, 11, 12 and 13. Department of Planning, Uttar Pradesh. (as per Annual Plan 2014–15). Strategy of Annual Plan 2014–15. Available on http://upenvis.nic.in/Database/Strategy_836.aspx. Kapoor, S. (2013). India and sustainable development goals (SDGs). November 12, on http://www.teriin.org/policy-brief/india-and-sustainable-development-goals-sdgs. Mondal, P. (2000). Relationship between infrastructure and economic growth in www.yourarticlelibrary.com/ visited on August 6, 2016.